Pizza-flavored ice cream now exists, and 2017 exploded. Little Baby's Ice Cream in Philadelphia has distilled 2017 down into three words: pizza ice cream. Yes, the internet's two favorite coping mechanisms are now combined in one, probably disgusting caloric treat. It's too late to figure out how we got here, so let's just take a look at the dessert we've all brought on ourselves. 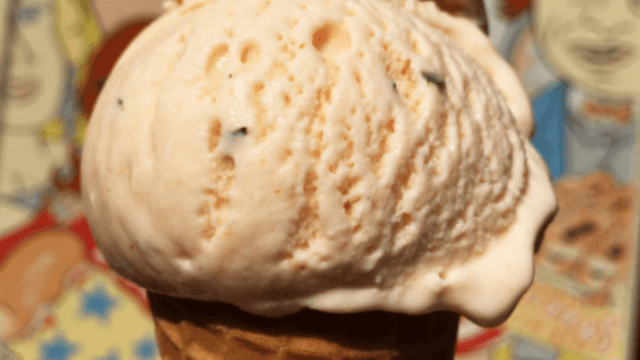 According to Refinery29, the pizza ice cream is actually for sale at Little Baby's — and it's flavored with tomato, basil, oregano, salt, and garlic. Basically, it sounds like a cold slice of pizza that you happen to eat atop a sugar cone. It's fitting that this shop chose to make pizza ice cream, since it also sells flavors called "Everything Bagel," "Cucumber Dill" and "Strawberry Celery." If you prefer to consume all your meals in ice cream format, Little Baby's is the place for you. People are going next level and eating the ice cream on a slice of pizza. When aliens invade, the below picture will be pretty much all we need to explain humans. The #FrankfordAveTaco : a scoop of pizza flavored ice cream from #littlebabysicecream on a slice from #pizzabrain. My Youth Council studies issues of importance in the local community, and pizza and ice cream are of high importance. It's officially the future in a time when we can eat pizza, we can eat ice cream, and we can eat pizza ice cream on pizza. Only one question remains. What flavor sprinkles would you get?